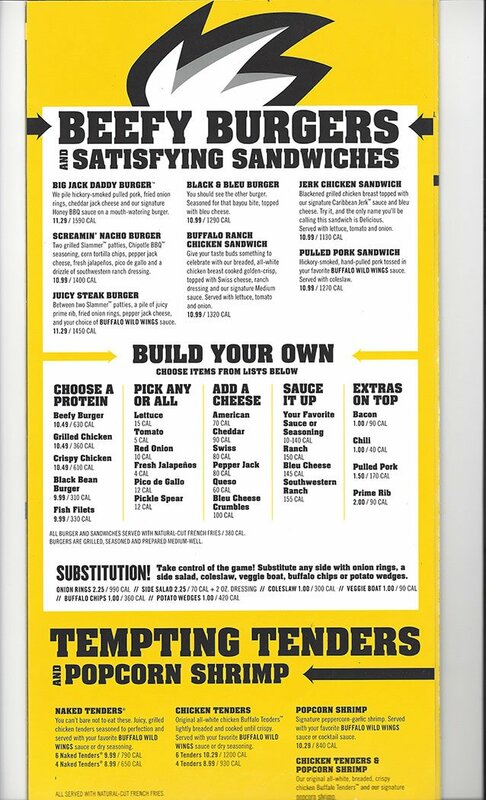 We have the entire menu with up to date prices for Buffalo Wild Wings®. If you are looking for a place to watch the game or share a beer with friends in a sports bar atmosphere with a huge selection of great finger foods as well as hearty meals, consider Buffalo Wild Wings. 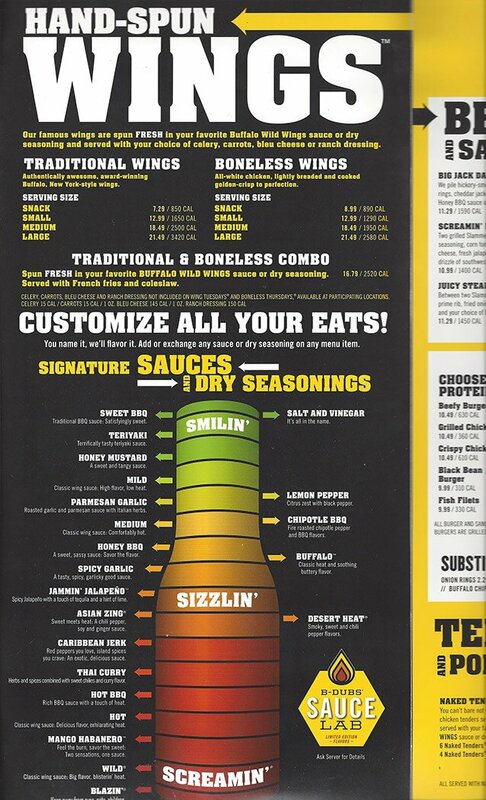 Buffalo Wild Wings has a huge selection of sauces and dry rubs from sweet to spicy to have on tender chicken wings on the bone or on bite sized boneless fried bites. They also offer plenty of sandwiches, burgers, salads and kid’s favorites to choose from. Natural-cut potato slices. Add one of our signature dry seasoning and they'll be gone in record time. All-white chicken, lightly breaded and cooked golden-crisp to perfection. 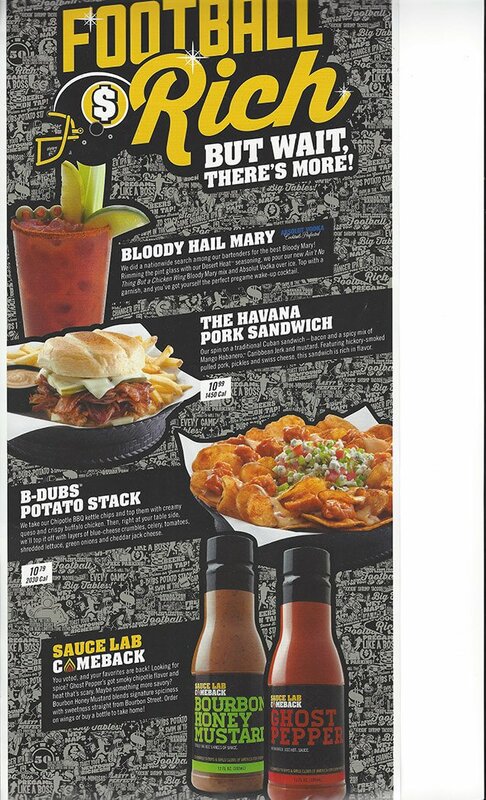 Spun Fresh in your favorite Buffalo Wild Wings sauce or dry seasoning. Served with French fries and coleslaw. Sweer BBQ Traditional BBQ sauce: Satisfying sweet. Teriyaki Terrifically tasty teriyaki sauce. Honey Mustard A sweet and tangy sauce. Mild Classic wing sauce. High flavor, low heat. Parmesan Garlic Roasted garlic and parmesan sauce with Italian herbs. Medium Classic wing sauce. Comfortably hot. Honey BBQ A sweet, sassy sauce: Savor the flavor. Spicy Garlic A tasty, spicy, garlicky good sauce. Jammin' Jalapeno Spicy Jalapeni with a touch of tequila and a hint of lime. Asian Zinc Sweet meets heat. A chili pepper, soy and ginger sauce. Caribbean Jerk Red Peppers you love, island spices you crave. An exotic, delicious sauce. Thai Curry Herbs and spices combined with sweet chilies and curry flavor. Hot Classic wing sauce: Delicious flavor, exhilarating heat. Mango Habanero Feel the burn, savor the sweet. Two sensations, one sauce. Wild Classic wing sauce: Big flavor, blisterin' heat. Salt and Vinegar It's all in the name. Lemon Pepper Citrus zest with black pepper. Chipotle BBQ Fire roasted chipotle pepper and BBQ flavors. Buffalo Classic heat and soothing buttery flavor. Desert heat smoky, sweet and chili pepper flavors. You can't bare not to eat these. Juicy, grilled chicken tenders seasoned to perfection and served with your favorite buffalo wild wings sace or dry seasoning. Original all-white chicken Buffalo Tenders lightly breaded and cooked until crispy.Served with sauce or dry seasoning. Grilled or crispy chicken, spun in your favorite Buffalo wild wings sauce, served over a bed of fresh greens with tomatoes, cucumber, carrots, onions, a blend of cheeses and croutons. Served with your choice of fruit cup / 35cal, carrots / 15 cal, or natural-cut french fried/ 420 cal, and milk/102 cal. Or soft drink/ 145 cal. You must be 1 or under to enjoy our kid's meals. Dont make us card you. Free refills on soda only. Our signature blend of wild fruits and berries are handcrafted with Tropicana Lemonade. It gives you wings - the kind without sauce. Although famous for their great tasting wings in a wide variety of sweet, savory and spicy sauces, Buffalo Wild Wings also offers other great starters and meals for both hearty and light appetites. 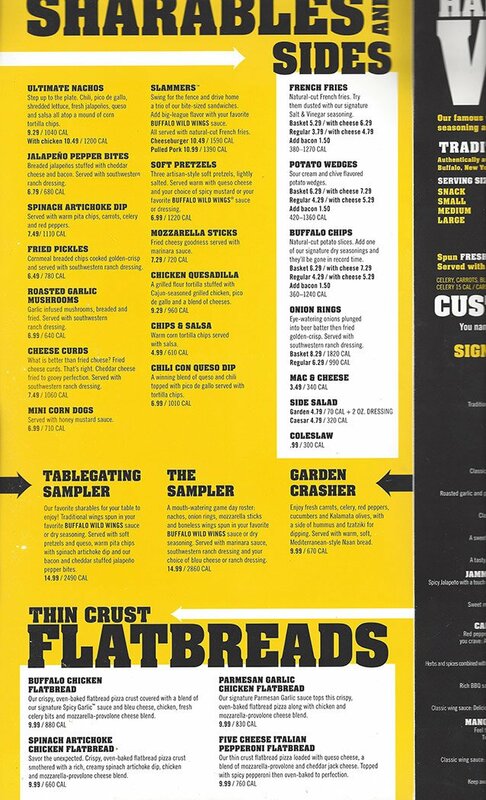 Fried Cheese Curds, Chicken Quesadilla and Garden Crasher are just a few of the options on the Sharables Menu that offers something for everyone. If you are looking for a meal there are lots of protein packed Salads, four different styles of Wraps, along with other favorites like Chicken Tenders & Popcorn Shrimp. And don’t miss the Burgers & Sandwiches Menu where you will find hearty options like the Jerk Chicken Sandwich and even a Black Bean Burger for vegetarians. Just one of the many specialty hamburgers on the menu, this bold burger offers plenty of texture and flavor. The burger is topped with crunchy tortilla chips, Chipotle BBQ seasoning, jalapenos, pepper jack cheese and finished with southwestern ranch dressing and a dollop of pico-de gallo. Served with Natural Cut French Fries for $10.99. If you can’t decide between tender wings on the bone, or the crunch of a boneless bite of fried chicken, have both with this combo deal. 17 flavors of sauce and dry season rubs (more if you count the special, limited time only sauces) are arranged from mild to flaming hot so that you can choose the taste that is just right for your palette. Served with fries and coleslaw for $16.79. The first Buffalo Wild Wings was built in Columbus, Ohio in 1982. Founders Jim Disbrow and Scott Lowery, both natives of Buffalo New York, had recently relocated to Columbus and wanted to recreate the great wings famous from their hometown. Within 12 years the franchise grew to 35 locations and Sally Smith joined the company as CFO and later CEO. 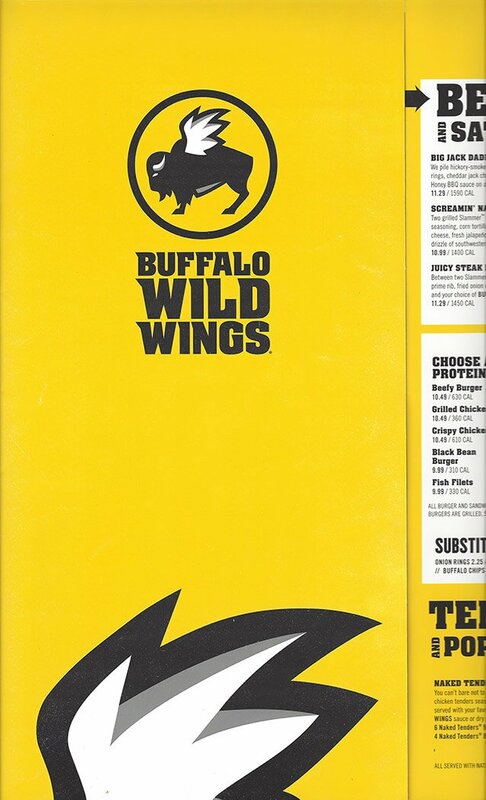 Buffalo Wild Wings went public in 2003. The original name of the restaurant chain was Buffalo Wild Wings & Weck. The Weck stood for a special sandwich that the chain offered. This is where the nickname of BW3 came from. 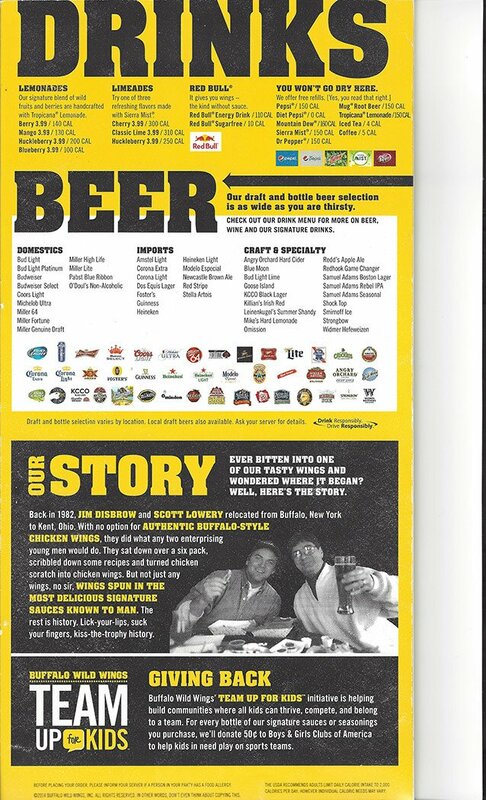 In 1998 the name was changed to Buffalo Wild Wings Grill & Bar, and in 2012, the name was shortened to Buffalo Wild Wings along with a refreshment of the logo and décor to emphasize the sports bar atmosphere of the chain. 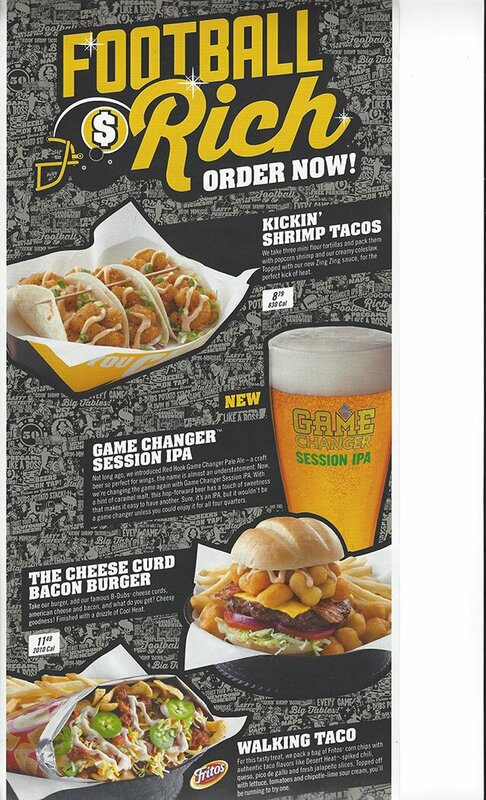 As of 2015, there are over 1,100 locations of Buffalo Wild Wings across the U.S.A.
Buffalo Wild Wings menu prices are subject to change without prior notice. Prices shown in images & the following table should be seen as estimates, and you should always check with your restaurant before ordering. 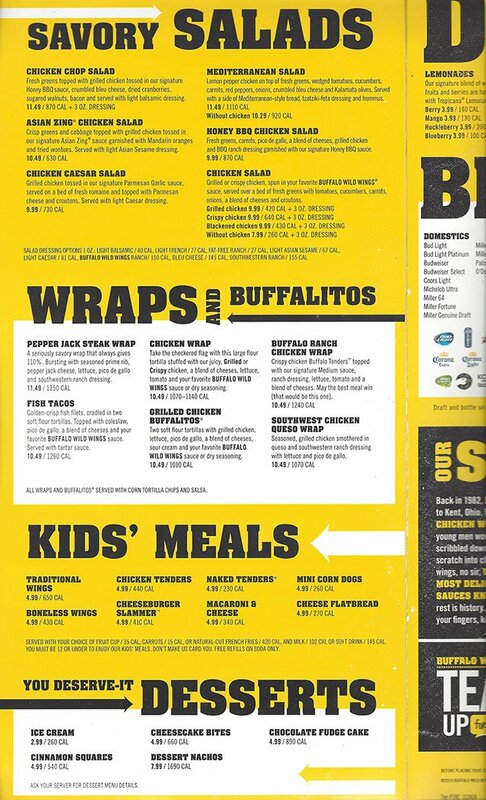 Buffalo Wild Wings menu images sourced via e-mail from restaurant customer & menu-price.net user. menu-price.net does not guarantee the pricing or availability of any menu items listed in image or table format on this page. Pricing may vary from location to location.